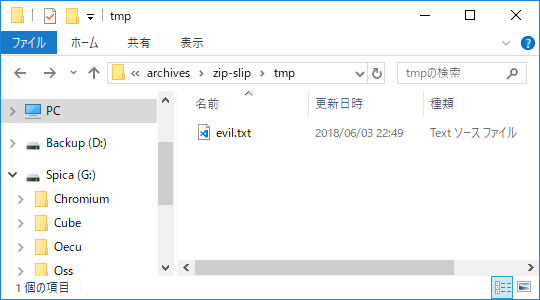 In the example below, we can see the contents of a zip file. It has two files, a good.sh file which would be extracted into the target directory and an evil.sh file which is trying to traverse up the directory tree to hit the root and then add a file into the tmp directory. When you attempt to cd .. in the root directory, you still find yourself in the root directory, so a malicious path could contain many levels of ../ to stand a better chance of reaching the root directory, before trying to traverse to sensitive files.